Did you know that a ham radio is your passport into a wireless world where you can talk to people locally, internationally and even in space without paying for minutes? Plus, the best ham radio base station works to intercept other signals and get out emergency messages when nothing else will due to power outages or cell-phone tower damages. Once you've gotten your ham-radio operator license to learn all about how to get the most out of your ham-radio base station and avoid fines from the FCC, then you'll be able to tell which features will matter most to you when you buy a new ham radio. However, since we know it's difficult to compare the many complex features of ham radios when you haven't had much experience trying them out for yourself, we've put together this in-depth review of everything you need to know about the top three best ham radio base station choices on the market. Powerful at 200W with a DC 13.8V supply. Separate control panel which can be used for base station. A great radio for the beginner or portable use. Good display, small size, and ruggedness. Very good xcvr with a precise and useful DSP implementation. A value for money capable HF Transceiver. The ergonomics and menu layout is very intuitive. When you want the greatest broadcasting-range capabilities in your ham radio, the Kenwood TS-480HX is the ideal choice. Users love how others can receive their signals from further away than almost any other popular ham radio, and it performs well even under what are normally difficult conditions for other comparable models. This Kenwood TS-480HX base station has bands from six to 160 meters, and most people find that it works well on a non-switching power supply of around 50 amps. While the standard model does not come with an antenna tuner, you can use a tuner like the Tucker model T-3000 digital-peak tuner for optimum broadcasting at six meters. If you use the Kenwood TS-480HX with the Fldigi computer program, then you can operate your radio from your computer keyboard by using your computer as a modem to type messages to others on the air. The software controls your radio through a serial-port connection. You can also use a SignaLink USB and other software to both send and receive your encrypted email through your radio if you lose your internet connection in an emergency. This guide on the Survivalist Blog explains more about how it works. It delivers a powerful supply of 200 Watts with a DC 13.8 Volt supply. This model has a lot more extra features than its competitors, like a separate control panel that you can use for a base station. The built-in antenna tuner works like a dream if you get the 100 Watt TS-480 SAT model. It cuts through all the "ambient noise" in the atmosphere that normally create problems connecting with radio operators farther away. That means it's easier for you to reach international stations. The setup is not intuitive. You're going to have to read the manual with this one and play with it before it starts making sense. If you want to use the station at its full capability of 200 Watts, then you need to spend a little extra for a 75-amp switching power supply for both inputs. If you buy the standard model, then you have to buy the antenna tuner separately. However, if you get a professional tuner, they're as easy to use as any other plug-and-play accessory. If all you want is to communicate nationally and locally with other ham-radio operators, then this Yaesu FT-450D radio is a great choice. Its "VHF" range, or very-high frequency transmission range, goes up to six meters. Please note that this base station does not work on the frequencies of the GMRS, or General Mobile Radio Service, and it doesn't transmit or receive on the bands of the FRS or Family Radio Service used by most short-range, handheld radios either. You can hear messages on CB or the Citizens Band with this radio, but you can't send to them because this is a dedicated ham radio primarily for amateur broadcasting. To boost the performance of the Yaesu FT-450D, use it with an external "SDR," or software-defined radio. An SDR lets you see an enlarged waterfall-style image of the frequency spectrum that your radio picks up on your computer screen so that you can tune in very precisely on faint signals with one mouse click. This Hackaday tutorial explains the process more. It's excellent for beginners or someone who wants something portable. The good-quality display isn't too big, and it has a long-lasting design. This ham-radio transceiver works well and has great digital-signal processing, or "DSP." Owners of this unit could reach the opposite side of the world when they used it with a half-wave dipole. Plus, it's highly compatible with nearly any antenna. Because it's small, one control does almost too much. That means it's sometimes confusing to use. The manufacturer printed the lettering on soft-touch rubber buttons, so they wear off quickly. Its internal automatic tuner is really limited. That means that you can't tune any random long wire without making some serious modifications to the setup. 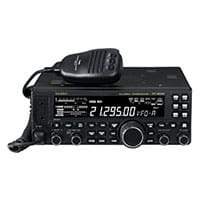 This Icom IC-718 ham-radio base station covers all American Amateur bands very well, and all you need to keep it running in emergency situations is a standard 12-volt DC power source. Plus, this radio can receive and transmit on 10, 20, 40, 80 and 160 meter bands, but the design isn't intended for use CB channels. While it doesn't have an FM mode, it does have AM, USB, LSB, CW and RTTY modes. One thing to consider is to get an attenuator to use with the Icom IC-718 whenever you hit a noisy band. It's a simple, resistive device to bring down a signal's amplitude without distorting it. The attenuator is important because it protects the highly sensitive measuring equipment within your radio. People who combined this unit with a multi-band, home-brew dipole have been able to win the WAC award from the International Amateur Radio Union for successfully completing two-way amateur-radio communications with stations on each one of the six continents in the world. It's a high-frequency transceiver that gives you the most for your money. It's absolutely one of the easiest transceivers to use. The layout of the menu just makes sense, and we love how ergonomic the design is. It has an auto-notch filter! That means the next time that somebody who doesn't know better tunes up their radio while they're on frequency, the auto-notch filter will remove the "offending operators" from your audio stream. The DSP on this model distorts the audio signal sometimes. The noise blanker should reduce some noises, such as a car starting, but this model's noise blanker hardly mutes anything at all. To really get the most out of this unit, then you have to buy an antenna tuner separately. For those of you new to ham radio stations, let's take a look at how these top base stations compare in terms of their key features. If you consider the price ranges, then the Kenwood TS-480HX is by far the most expensive model that packs the most power. 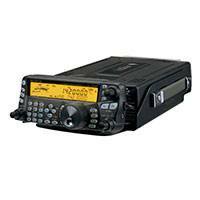 The Yaesu FT-450D is only slightly more money then the Icom IC-718, which is the most-economical choice of the three. Looking at their transmission ranges, the Yaesu FT-450D receives a range of signals from 30 Khz to 54 Mhz, including all shortwave and AM broadcasts. The Icom IC-718 receives AM signals and ranges from from 0.5 to almost 30 MHz, but the Kenwood TS-480HX has a superior range of 500 kHz to 60 MHz with a TX covering all amateur band signals from 1.8 MHz to 50 MHz. Plus, the three stations all have different designs to suit different types of broadcasters. The Icom IC-718 is a lightweight model at just below 8.5 pounds that's good for traveling, while the Yaesu Original FT-450D is for average use at nearly 13 pounds. The Kenwood TS-480HX is the most heavy-duty model for serious broadcasters committed to one broadcasting location, coming in at 14 pounds. All of these three ham radio base stations are good-quality pieces of equipment. However, we felt that the most-important considerations for any ham radio operator who's serious enough to buy a base station -- as opposed to a little handheld device like a license-free CB radio set -- are the transmission range and consistently high sound quality. 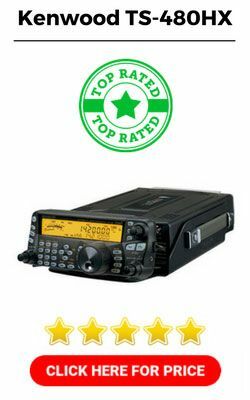 That's why after comparing these top three options for the best ham radio base station, our winner for this roundup is the Kenwood TS-480HX. It's simply the most-powerful ham radio base station that allows you to transmit and receive signals at the greatest distances in excellent-quality sound. The Kenwood mobile hf radio requires a high amp 13 volt power supply, more than 20 amps. Unless you use a lower power setting. It will kill your car battery in less than 30 minutes of use. Also the control panel you talk of, should. Be a remote head as the control function on the front face of the radio can be removed and mounted remotely on a desk away from the radio. I think you described this wrong.